The Tempest | Painted Ponies Everyday Figurines | One Price Low Flat Shipping! 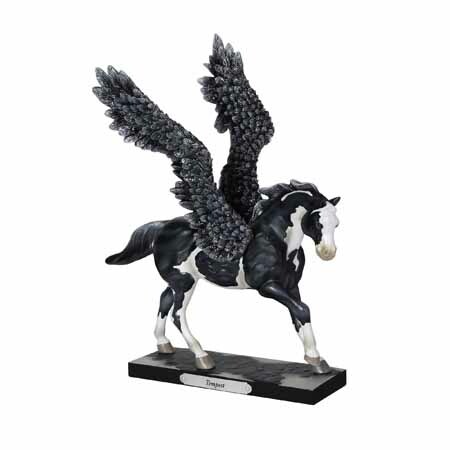 From the Trail of Painted Ponies September 2018 Release, The Tempest, black and white pegasus horse figurine. Designed by acclaimed equine artist, Star Liana York. Made of stone resin. Measures 10.5" tall. Santa Fe sculptor Star Liana York created the spectacular Painted Pony titled Silver Lining, which was her representation of the mythological horse Pegasus soaring towards the heavens on a mighty set of wings. With Tempest she has re-interpreted her original concept to depict Pegasus searching through dark and churning storm clouds in search of the elusive silver lining of blue skies, thereby giving her original Pony an entirely new feel and meaning.